Fluctuations in the changing tastes of the public and even the artists themselves are explained by the satiety of some images and the demand for fresh impressions. Therefore, not only styles replace each other, but the basic concepts. The ascetic Georgian direction in England was replaced by charming details of the Victorian style, and the lush rococo in Europe was quite unexpectedly replaced by a craving for strict and laconic forms, frivolous decorations gave way to strict and harmonious laws of harmony. So there was an idea of a revival of traditions of antique cannons, following classical laws of interior planning. Quite naturally, these ideas formed the basis for creating a new reading of classical images. So the neoclassical style appeared. Architects and artists enthusiastically embraced the idea of creating a new model of beauty and harmony, based on the ancient canons. However, modernity dictated more democratic forms, without excessive majesty and massiveness. The new direction turned out to be much more democratic than its origins, and this delighted the public and the creators themselves. Ideologists neoclassicists were very famous architects from England, France, Germany. They created a new fashion and new style, inspired by the ruins of Pompeii and the Parthenon. It is at this time that it is customary to calculate the birth of an interior design, the founder of which is the Englishman, Robert Adam. He paid great attention to detail, and considered the interior decoration of the room, as a continuation of his appearance. Was the neo-classical blind copying the classic samples? Of course not. Neoclassicism had much lighter and more straightforward forms, and also followed the ancient rule of the golden section. This gave Neoclassicism architectural forms harmony and completeness, without the use of unnecessary decorations, ornaments, and intricate details. Taking as a basis ancient samples, the neoclassical style returned to the rigor of forms and lines, a rectangular articulation, which was strikingly different from the whimsically curved images of Rococo and Art Nouveau. Neoclassicism was emphatically relieved of all superfluous and burdening. However, to call this style ascetic, would mean, to slander against the truth. He rejected excesses but welcomed harmony and manifestations of beauty. It was emphasized by the color scheme. It was distinguished by its subtlety, the predominance of bright, clean shades. Actively used gold and bronze colors. Among the favorite tones, you can note a noble blue, warm shades of brown scale, light caramel, beige and apricot notes. 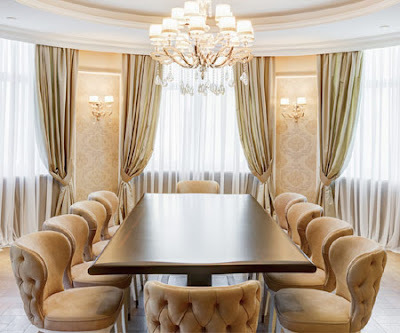 Exquisite and justified decor in the neoclassical is also encouraged. This style has not escaped exotic influences. It was then that the Egyptian campaigns began, so the interest in the ancient and mysterious culture was reflected in the samples of neoclassicism. Elements of ornaments very often had quite a recognizable coloring - Egyptian ornaments for textiles, pyramid images, typical African landscapes, use of the favorite combination of pharaohs - gold and azure stripes - all this marks the neoclassical style of the interior. It can be said that he preceded the craze for Egypt, which confidently embraced Europe several decades later and was reflected in many design directions of the 19th - early 20th centuries. The popularity of neoclassicism in the modern world is due to the high degree of its universality, which allows you to decorate the interior of even a very small room. In addition, unlike the classical interpretations, this option looks much easier, practical and better suited for functioning in a modern dynamic world. 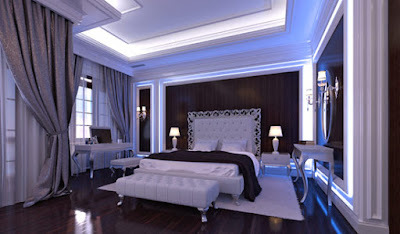 How to design the interior in neoclassical style? Finishing materials should be chosen as close to natural. For all its democracy, neoclassicism belongs to historical styles, so the presence of modern imitation materials is best minimized. The decoration of the premises in the style of neoclassicism allows you to do without complex architectural forms. 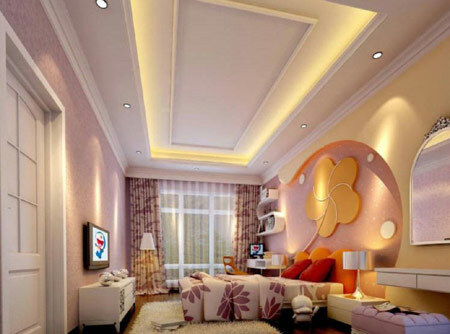 The right emphasis will help create a multi-level ceiling. It can be either suspended or tensioned. Please note that the steps of the ceiling do not differ smooth lines. On the contrary, the elements are connected at the corners, creating strict and hermetic forms, which are prescribed by the neoclassical. 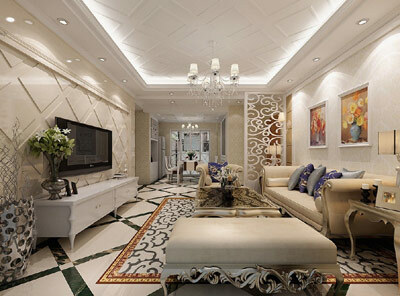 As a floor design, ceramic tiles or polished stone are most often used. 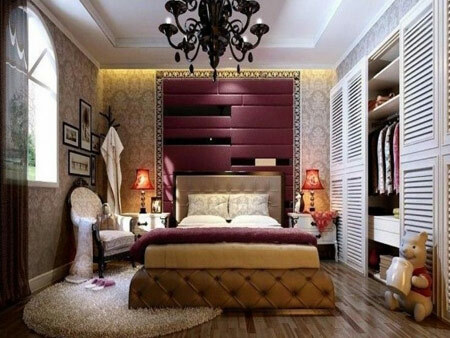 In the bedrooms, wooden covers are more popular. In this capacity, parquet, parquet board and even modern laminate can be used. It will be appropriate to cover the floors with carpet or high-quality carpet. The monochrome will make the appearance of the room more dynamic and modern, and the traditional patterned carpet will give the room warmth and comfort. 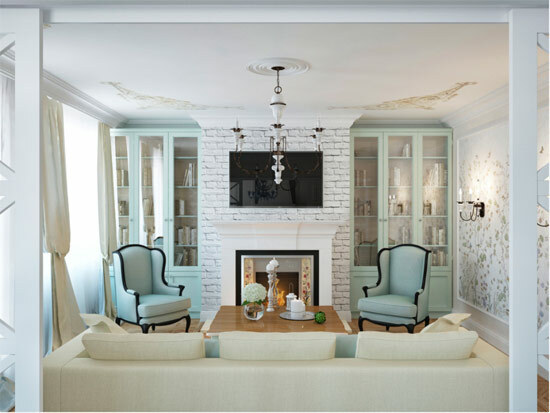 Walls in the neoclassical interior can be finished with a variety of materials. 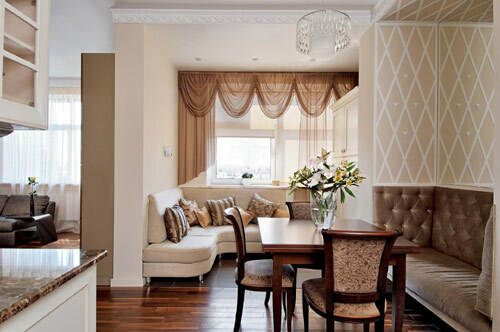 Suitable wallpapers, decorative panels, simple staining or Venetian plaster. Quite exquisitely looks textile design in the form of tapestries, wallpaper. If the size of the room allows, then the finishing methods can be combined within the boundaries of one room. For example, raise the decorative wood panels by one third, add wallpaper to the wallpaper with a homogeneous pattern, and add to them alternating vertically oriented tapestries. 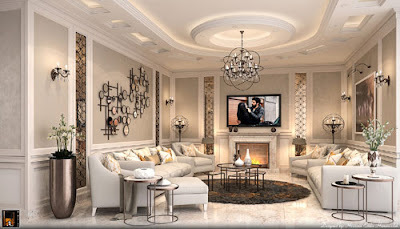 The niche of one section of the wall, for example, allocated for the placement of a plasma television panel or a fireplace, also looks good. Modern trends suggest the decoration of some of the walls with more modern materials. For example, glass panels with hand-painted or metalized tiles, which reflects all the light streams in the room. So everyone can choose their own version of wall decoration - either traditional using classical methods or modern and trendy, which actively uses technological innovations. Furniture for the room in neoclassical style will require good quality, concise and harmonious forms. Curved and forged headboards, intricate armrests, massively carved pads - all this for other rooms. Neoclassicism requires natural wood, good dense fabric, flat surface. You can choose several antique items, but they are designed only to place the emphasis but do not become the main characters. Upholstered furniture is represented in neoclassicism very widely. Armchairs, half-armchairs, soft chairs with armrests, sofa or ottoman can also find a place in a spacious room. And from ottomans it is necessary to refuse, they concern for other fashion and style. 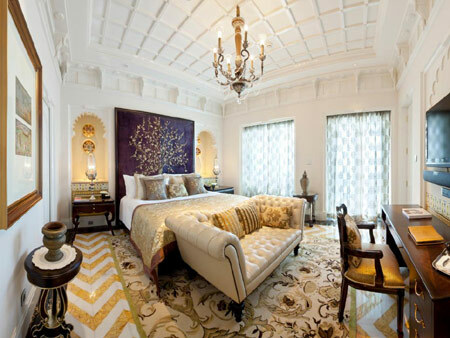 An indispensable attribute of the neoclassical-style room is the central chandelier. And here fantasy can manifest itself to the full. Complex multi-story structures, decorated with hanging drops, crystal chains, crystals, metal inserts. Such a chandelier seems to take revenge for the severity of the forms of other parts of the interior. Not surprisingly, sometimes this piece of the interior looks like a central element of the room. However, this is not entirely correct. 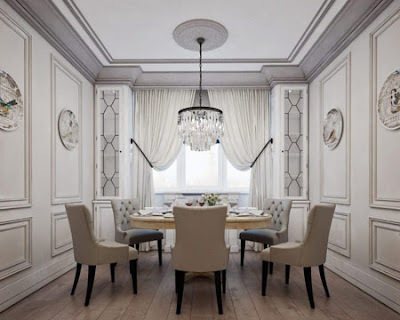 In the neoclassical interior design, harmony is needed in everything, so it is better to give preference to the chandelier exquisite, rather than over-decorated. The lighting system is necessarily supported by additional lamps. 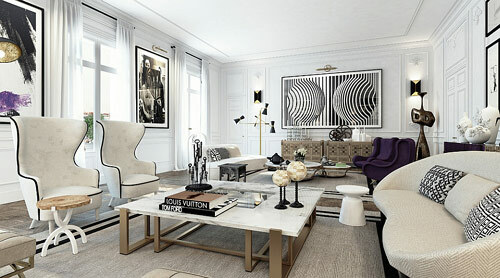 For the living room, you can choose floor lamps, for the bedroom - table lamps. They do not need to be paired, although symmetry is welcome. Lampshades for them are better to choose the classical form, milky-white, it is possible with a thin gold or color pattern. As a rule, the feature of such lamps are stands made of natural wood or stone. Thanks to them, these elements look noble and exquisite. It is not enough just to finish the room and arrange furniture. 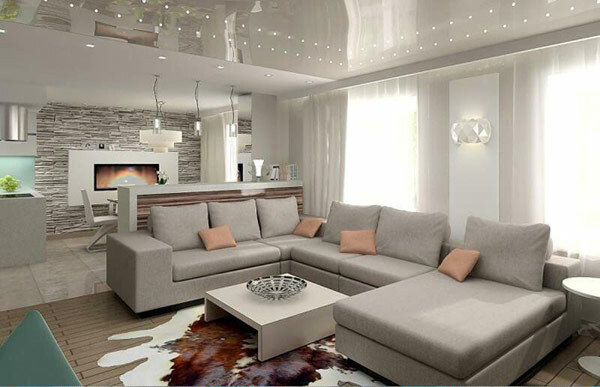 In order for the interior to acquire a real residential appearance, the steel is stylish and, at the same time, cozy, it needs to be decorated, adding a few important details that will help to unite space into a single interior picture. For neoclassical interior design, this can be done and needed with minimal means, redundancy only hurts a strict and refined image. A popular decoration for rooms in the neoclassical style will be a fireplace. The working part of it can be electric or run on biofuel, but the frame is executed in all classical canons. Even a small fireplace will be an excellent stylistic addition to the room. Another universal decoration of the interior will be a mirror in a beautiful frame. 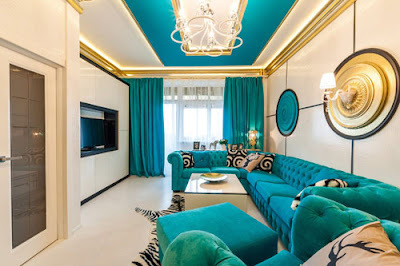 Before the mirror shine, no interior can stand on the basis of the classical and ancient principles of beauty, so very well the mirror surfaces fit into the idea of universal harmony, enlarging and lighting space by its appearance. 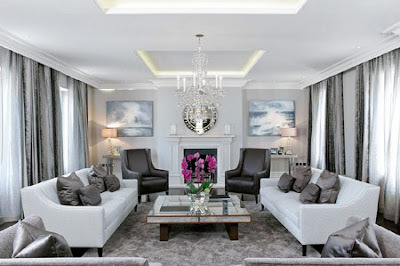 So the mirrors are perfect for decorating any room in neoclassical style. As a frame, you can choose wooden with gilding, twisted or forged. 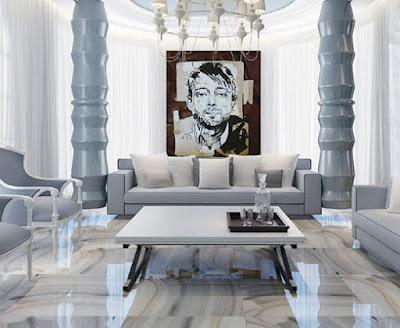 Pictures are not so often found in modern neoclassical interior design. Their role is increasingly performed by television panels, occupying a central place of attention. But more often they began to use a fragmentary painting of walls, reviving the interior and filling it with new emotions. A special charm and comfort of the room are attached to natural flowers and plants. They are quite appropriate in the neoclassical style. Especially popular plant with large, white or red flowers, like calla and anthurium. Lush and small flowers, for example, violet or azalea, are considered more suitable for modernity and rococo. 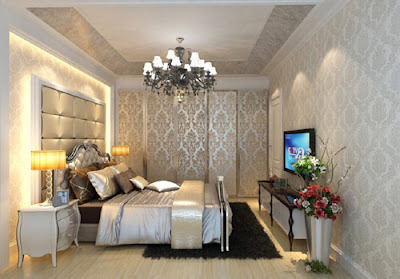 The textile decoration of neoclassical rooms is distinguished by a special thoughtful refinement. Redundancy here is inappropriate, therefore, each element should be selected with particular care. For the living room is quite enough to be a carpet on the floor and a beautiful curtain composition of simple, concise forms. 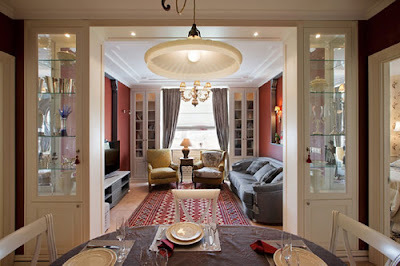 Curtains can go up to the floor, or frame the window space, just slightly going beyond it. 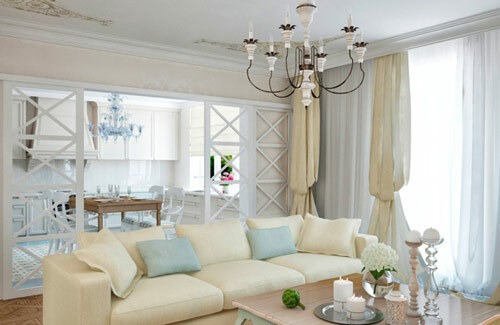 The basic requirement, fabrics for curtains should be harmoniously combined with the general color registration. The composition is not decorated with ruffles and flounces. The maximum that can be allowed is an elegant lambrequin. Instead of carpet on the floor, you can put a coating that mimics the animal's skin, this will add a dynamic to the image. Complement the textile decoration of the living room with decorative cushions on the couch, which too should not be too much, 3-4 pieces will be quite enough. In a neoclassical bedroom, there will be more textiles. But the requirement for a general harmony of the room should be observed here. As the design of a bed is better to prefer heavy fabrics, which lie down beautifully, forming flat surfaces. Curtain compositions for a bedroom can be selected as multi-layer, however, excessive decorations and excessive amounts of fabric on windows should be avoided. In modern design, neoclassical images are often complemented by modern elements, modern design styles. This can be welcomed, as similar experiments benefit the style, refreshing the images and attracting the attention of new fans. 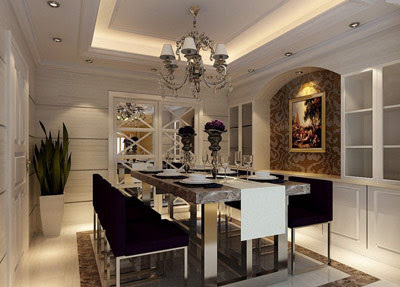 Therefore, do not deny the creative impulses in the design of neoclassical interiors. 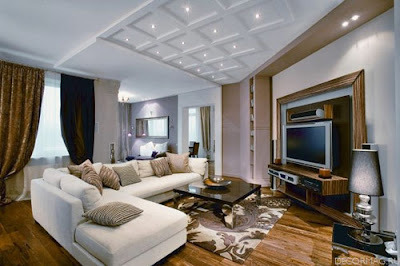 A stylish lamp in a minimalist design or a high-tech chandelier will give a completely new, dynamic accent to the room. The style of the neoclassical in the interior from this will only benefit.